Audi is launching a campaign that might be difficult for consumers to pass by without noticing. The automaker bought a billboard in New York City on the roof of a building surrounded by office towers, including Bank of America and Salesforce. The billboard, which says: “Enjoy the view from the top. The Audi A8,” targets executives. Located above the DaDong restaurant at 3 Bryant Park, it will be on display through Nov. 11. 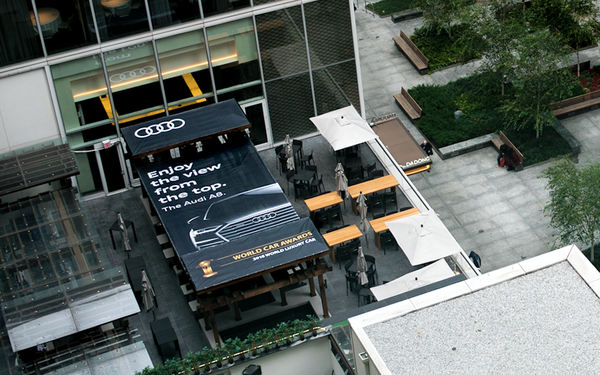 The first-of-its-kind advertising placement for the auto industry (according to Audi) was created by converting an unused rooftop into an executive eye-view billboard. It was developed by Venables Bell & Partners, PHD Media and Outdoor Company. The luxury automaker is also surprising magazine readers with an interactive print ad for Audi A8. The four-page print insert emulates the premium taillights of the vehicle. By opening or closing the pages of the insert, readers are able to activate digital animation that resemble OLED (organic light-emitting diode) taillights on the 2019 Audi A8. Additionally, the insert comes with a special key fob that allows readers to control the lighting with the click of a button. “We’re always looking for innovative ways to reach current and prospective Audi owners, so this immersive, tech-forward approach to print was a natural fit for the brand," Loren Angelo, vice president, marketing, Audi of America, tells Marketing Daily. The ad appears in the November/December issue of Departures magazine, which is geared toward an affluent readership and sent free to American Express Platinum Card members. The Audi A8 insert was sent to 25,000 Departures readers who were randomly selected within the top Dealer Marketing Associations. It is the first print ad of its kind in the magazine, according to the automaker. Venables Bell & Partners created the ad, while the technology is from Structural Graphics, which developed the LEDs to mimic the A8 lighting design animation.